The Epson AcuLaser C9200N A3 colour laser printer promises to improve productivity and efficiency with its network-friendly features and superb colour printing technology. The Epson AcuLaser C3900N laser printer is fairly fast and versatile, but its overall cost-efficiency is doubted by small offices with limited budgets. Measuring 823mm wide, 477mm tall, and 608mm deep, the Epson AcuLaser C9200N is a box-shaped device that weighs 49.5Kg, making it one of the heaviest and bulkiest laser printers around. The understated monochromatic design's centrepiece is the top panel, which is home to minimal controls, the output tray, and a backlit display screen. The expandable C9200N printer offers room for an additional 500-sheet paper cassette. 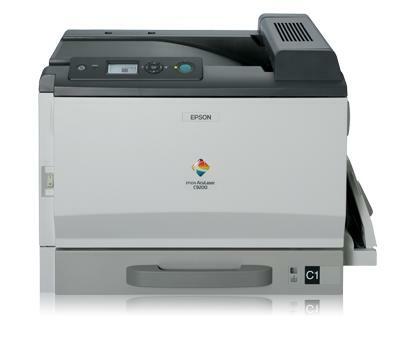 The Epson C3900N colour printer mainly runs on a 600MHz processor with 256MB of memory. The Epson AcuLaser C9200N can print up to 26ppm in black-and-white and in high quality 2400dpi. Workgroups can connect with ease using Ethernet, or individual users can enjoy high-speed connectivity via USB 2.0 and print directly from CompactFlash cards. Paper handling is versatile and users can upgrade to an optional duplexer to increase the overall capacity to 1850 sheets. The standard memory of the AcuLaser C9200N can also be upgraded to 768MB. The prices of consumables and upgrades are too expensive for a small business. The Epson AcuLaser C-9200N printer is quite slow when printing colour. Speed and overall performance is easily compromised when the Epson AcuLaser C9200N colour laser printer is shared by more than 10 users, especially if the standard RAM is not upgraded.